A number of things can damage teeth--decay, a blow to the mouth, teeth clenching, and more. Do difficult circumstances always spell extraction? At Sean R. Bates, DDS & Associates, your Sarasota, FL, dentist places beautiful porcelain crowns over weakened teeth, preserving their function and improving their appearance for years to come. To determine if a crown would help your tooth, your Sarasota, FL, dentist will examine it carefully and X-ray it to look at its roots and supporting bone. If appropriate, Dr. Bates will proceed with the crown treatment, removing the damaged portions, and taking oral impressions to help the dental lab craft the crown from a solid block of porcelain. Crowns mimic a tooth's natural shape, color, and sheen. Truly, they are works of art. The American Dental Association says a crown will strengthen your tooth almost indefinitely if you care for it with good at-home and in-office hygiene. In addition, Dr. Bates use crowns to cover dental implants, tooth replacements comprised of a titanium screw, metal post, and customized crown above the gum line. Crowns are the final touch in root canal treatments, which remove inflamed interior pulp and seal infected or cracked teeth. Finally, dental crowns attach single- or multi-tooth bridgework to adjacent natural teeth. In summary, crowns support, protect, reshape, and beautify teeth, which otherwise would fail and require removal. In a large sense, crowns spare natural tooth structure and save patients a lot of money because tooth replacement with dental implants or other prosthetics can be very expensive. That's what dental crowns are. 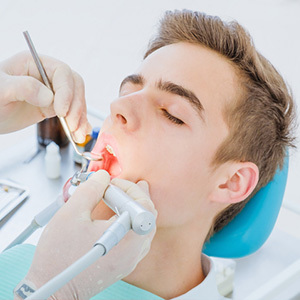 So, if your Sarasota, FL, dentist recommends one for a tooth, which is in trouble or needs reinforcement, go ahead with this simple, painless procedure. You'll be glad you did. Contact Sean R. Bates, DDS & Associates at (941) 966-4751 to schedule a consultation on dental crowns with Dr. Bates!